My mother always called it “the credenza,” a fancy name for a small cabinet holding a few liquor bottles (for my parents’ few parties) and blackberry Manischewitz (for shabbat). On top sat whatever family photos were in rotation and a bronze statue of Moses holding the ten commandments. I didn’t always know it was Moses. At first I thought he was a mythological creature, and given my views on religion sometimes, that wasn’t far off. Plus the statue, a replica of the one made by Michelangelo, had horns. As a kid growing up in the south where some people believed Jews had horns, I didn’t think Moses was doing a good job bucking stereotypes. But he was there through my childhood and teenhood, watching with steely eyes when I stole a taste of rum and refilled the bottle with tap water. Consider him a biblical precursor to Elf on the Shelf. One day, after college graduation, after my parents divorced and remarried other people, Moses was replaced by a crystal bowl. This February, I traveled to Israel with a group of 17 other children’s writers, a trip that was sponsored by the PJ Library. The goal was to make connections, with Israel and with each other. I’d been in a stuck place in my writing for many months, and I thought what I needed was desert air and a brand new landscape. But in many ways, Israel felt like a return to a place I’d never been. That feeling was confirmed when we visited Sde Boker, a kibbutz in the Negev and the last home of David Ben-Gurion, the first prime minister of Israel. 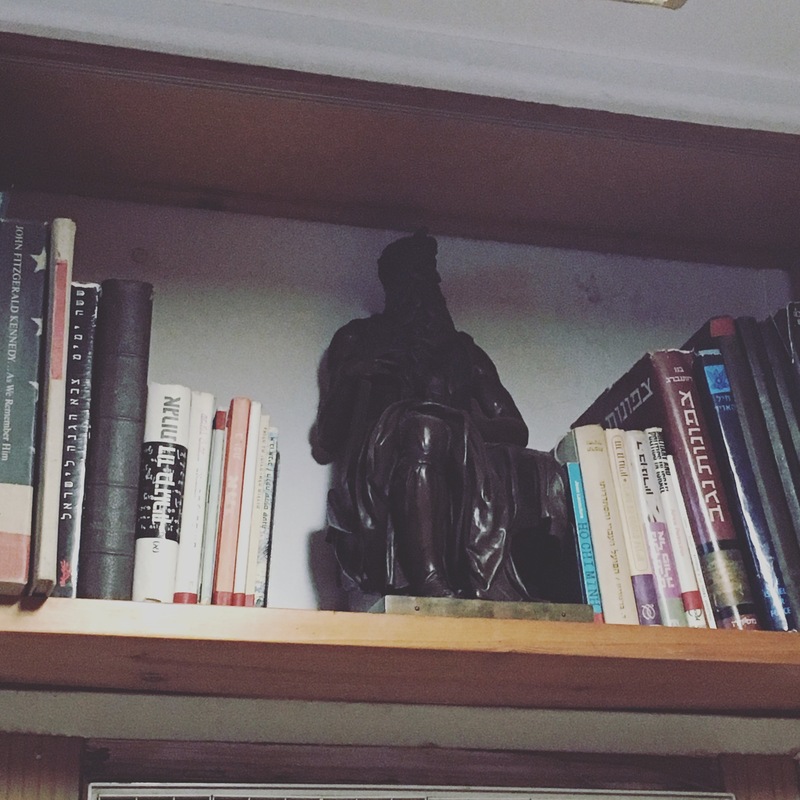 There on a shelf was the statue of Moses I knew from my childhood, watching over Ben-Gurion just as he’d watched over me. This entry was posted in Israel, PJ Library Israel Trip, Uncategorized. Bookmark the permalink.